If you are trying to find a nice place for relax and recreation in Male Karpaty, than is our little village Dolany for you the right choice. Dolany are situated in the Malokarpatia wine region, which offers a lot of possibilities for a different activities for you and your family. Even if it’s a visit of Cerveny Kamen (Red Castle) with its rich program, hiking or wine tasting – everyone can find something for yourself. Available are two apartments with its own entrance from the patio of backyard. Its equipped with a kitchen, living room with sofabed, dining table and TV. 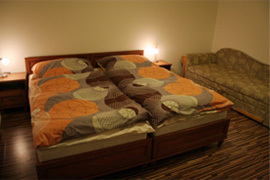 Doublerooms have its own bathroom and possibility of extra bed. To the accommodation we offer the possibility to order breakfast. 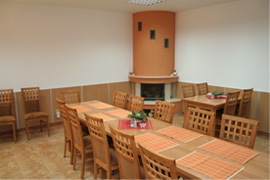 On the main floor is situated a common room for organising events or company trainings. We provide also classic and reflex massages and banking.